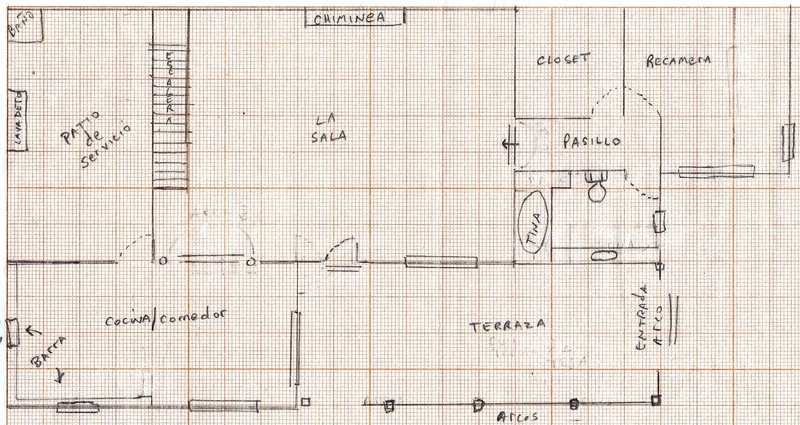 HERE IS THE “blueprint” for the construction of the Hacienda. It was drawn by me back in 2002. I’m no architect, obviously. It’s on standard graph paper. It’s the ground floor. For some reason, I did not save the plan for the second floor, but I do have one for the window designs, which I did, and another for the electrical schematic. I used to be an electrician. Did you know that? The only changes to the downstairs plan are that the stairwell to the left of the sala (living room) could not go directly up. It had to hang a right up top and continue, a question of physics, and we extended the recamara (bedroom) about a yard farther to the right to make it roomier. The second floor is one huge space, a fireplace, a walk-in closet and a bathroom with shower stall. The upstairs terraza covers the downstairs bedroom, closet, hall and bathroom, the same fat L-shape. The second floor extends from the stairwell all the way to the right. The downstairs terraza and the kitchen/dining room (cocina/comedor) have no second floor above. The “patio de servicio” at the top left is open to sun and rain. That’s where you’ll find the propane tank, the washing machine and the clothesline. At the very top left you’ll see a bathroom. It only has a toilet, and it was there when we bought the property, a brick outhouse. We just left it in place. It’s now a storeroom with a never-used johnny. The living room is slightly sunken, my wife’s idea. There is one step up to the dining room/kitchen and a step up to the pasillo (hallway) at the right. Both of these have a stone archway above, which is snazzy. 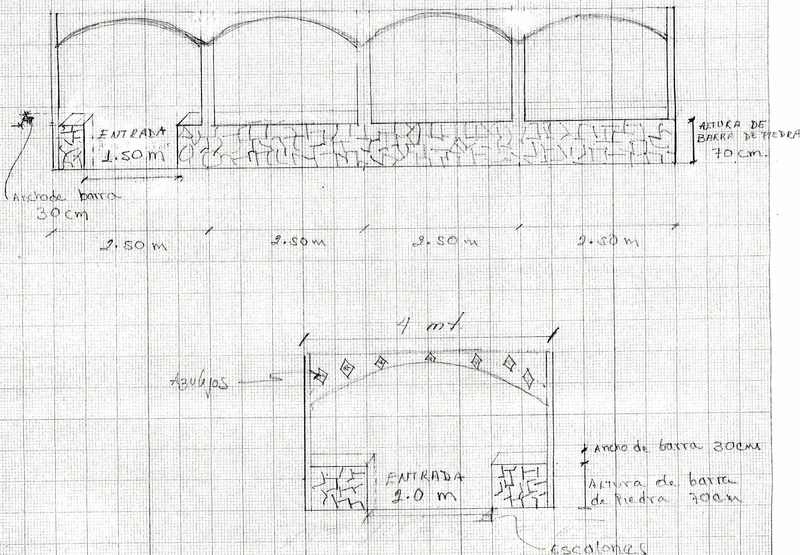 The design below is the downstairs terraza, side view, drawn by my wife who used to be a civil engineer. Did you know that? Click on either drawing for a closer look. Before the three albañiles (bricklayers but far more) and the helper began work in August of 2002, we got a permit from City Hall, and that was the end of that. No one ever came to check the work. Construction lasted nine months and cost just under $100,000. We moved here in May of 2003. The photo at the very bottom was taken around 2006, I’m guessing. You would be looking at the top diagram from the right. See that baby palm at the bottom left? It’s now about 18- to 20-feet tall. The only drawback to being our own architects is that the living room could use more light. The windows facing the downstairs terraza are huge, but the downstairs terraza is wide and roofed, so little light enters through those windows. An architect would have seen that coming. No matter. It’s why Edison invented light bulbs. And, as always, tons of photos can be found here. Nice house. You did well. Señor Gill: It was a fascinating experience for me. I knew squat about Mexican construction at the time, and it’s very different from how houses are built above the border in many respects. It was fun to watch. We lived in a rental about 10 minutes away at the time, and we were here virtually every day for the nine months. We came every morning to see what the honcho needed in materials for the following day or the same day. Then we would drive to a supply place to buy whatever was needed to have it delivered, usually that same day. And then we’d show up again every evening just to see what had happened. So, at least twice a day. Mexican construction has no crawl spaces, no 2-by-4 studs in the walls, no attics (usually), no basements. Probably the strangest part of all for me was learning how ceilings/roofs are built using tree trunks to support them until the concrete is dry. I really loved watching it all, and I took photos of the entire construction process. Those photos were digital, and they all vanished shortly after we moved in due to a suicidal hard drive. No backups. Stupid, stupid, stupid me. Mexican architecture includes stairwells without hand rails. I find that real scary. They put pipes under the concrete floor. This makes for problems later. It is better to place them over head for easy repair access. Gas pipes should never be under the concrete slab. Then there is the registros, it is better to use pvc pipe with clean outs. Rain water should not go into the fosa septica, but elsewhere to a dry well. I have a whole list of things that I would want to have done my way, but I don’t think that will ever happen. Señor Gill: Our stairwell to the second floor was built without hand rails, but we added it later, an arty one. Our pipes are under the concrete floor. Never been a problem. Our gas lines are not under the floor but embedded in the brick walls. Never been a problem. We have no septic tank except out front for the bakery addition. No rain goes in there. I think that Mexicans have figured things out fairly well over the centuries. The construction methods are not always modern, not always how the Griingos do it, but they seem to work just fine. I give builders here free rein most of the time, figuring they know better than I do. I’ve rarely been disappointed. The hacienda is beautiful. And I did not know either of the two trivia facts you mentioned. You and your wife were a good team in the planning of the home. Angeline: Yep, it’s a beautiful place, and I often brag about it here, probably way too often for people who’ve been longtime readers. Ni modo. Yes, I was an electrician. I have an associate degree in electrical construction technology from a community college in New Orleans, something I did in the early 1980s, trying to get out of the newspaper business. Did not work, but at least now I can wire a house. I’ve done industrial work too, and I freelanced for a spell. None of that lasted more than a year, however. And my wife was a civil engineer working for the Mexican Highway Department when I met her. She’d been doing it for 14 years and lived in Mexico City when we met. I dragged her into early retirement at the tender age of 41. I retired early, but she retired waaay early. How many circuits did you install in the house? Ms. Shoes: If memory serves, and I think it does, there are four. Only four?!? That’s one of my big complaints with Mexican houses in general — too few circuits. Why so few for your (rather large) house? So did you do the wiring? Or just supervise? Kim: Four circuits is plenty for us. Never had a lick of problem. In spite of the house being fairly large, our electricity usage is meager. We don’t have AC, heating grids in the floor, clothes dryers, etc. Very little high-tech stuff at all. People here whom we know of with significantly smaller houses have much higher light bills. Our most recent electricity bill was 330 pesos or about 20 bucks at the current exchange rate, and that bill is for two months, not one, so … ten bucks a month. Who needs more than four circuits? I neither did the wiring nor supervised. I just drew a wiring plan for the fellows, noting where I wanted all the wall outlets and overhead lights and switches. P.S. : Though I can wire a house, I did not wire our house. We hired a couple of moonlighting schoolteachers who did the entire shebang for about $2,000. They did the plumbing too, which was included in that same $2,000. Our construction honcho recommended them. He also recommended an old painter who first primed the entire place with whitewash before going back and putting two coats of color everywhere, inside and out, for about $3,000. Are you speaking in pesos or dollars? Don Cuevas: I usually make that quite clear, but I did not do it well this time, did I? They charged me in pesos, of course, but the dollar equivalent was about what I wrote here. At the time, about all you had to do was add or subtract a zero. The exchange rate was near 10:1. It is one of the most welcoming places I have visited. Now, you need to come to el casa sin nombre. Probably in the winter. I know your feelings about our balmy summers here on the Pacific. Señor Cotton: Thanks. As for visiting your Casa Cotton (no name my backside), we would if you did not live so far away. Why did you do that crazy thing? By the way, it’s la casa, not el casa. Hit those books, señor! Spend afternoons at a coffee shop that doesn’t cater to Gringos. Talk to the locals. Little by little, you’ll be jabbering in Spanish like you wuz born here. I promise. Very nice, Felipe! The design and choice of colors and materials is very pleasant to the eye. Is the photo above from the front of the Hacienda an image from your new camera? Gracias, Jeff. I like the colors myself, most of which I chose personally. The only space in the house where my wife picked the paint is the bedroom. It’s (yuck) beige. What sort of Mexican is she? The photo is from almost a decade ago, so it likely was a pinhole camera I was using. The yard and exterior are quite different now, mostly from plants. Former electricista, eh? That’s a surprise. I knew about your wife, as you’ve written about her career before. And given her career, I’m a little surprised that she didn’t do all the drawings, something I had incorrectly assumed all these years. And as someone who’s been there, I can attest to it being a lovely house. Where we like the idea of designing our own house too. Maybe some day. Kim: People come by here and almost invariably think this place is mostly or totally my wife’s doing, especially the decor, but it’s actually precisely the opposite. She was just along for the ride. The design was, to a large extent, a copy of the layout of the rental house where we lived previously. I was there 2.5 years, and she was there a year. I liked the layout there a lot, and I just made it much larger here. When I was in my early 20s, married to my first wife, I dreamed of a Mexican-style home, and I used to do plans on paper. They were very different ideas from what we now have — it was only one story, for example — but I find it interesting that I was thinking of such a thing so long ago. P.S. 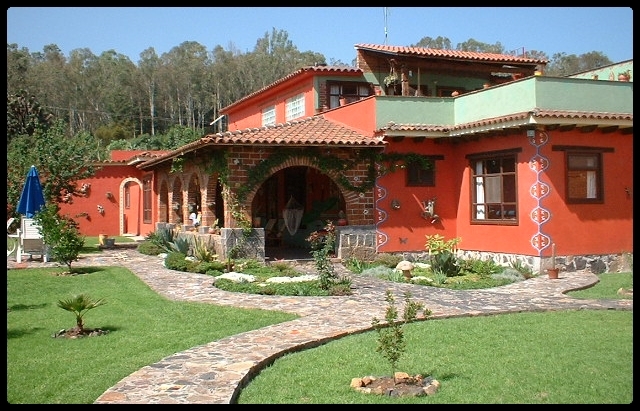 : Oddly, though I dreamed of a Mexican-style home, I did not think I would be living in Mexico. I was planning to build that home in Louisiana.